AIIMS MBBS Result 2018 at www.aiimsexams.org – Medical Entrance Exam Results Merit List : All India Institute of Medical Sciences has successfully conducted the MBBS entrance examination on May 26th & 27th. A large number of aspiring candidates who are seeking to get admissions into 7 AIIMS institutions situated in different states of India have applied and appeared for the AIIMS MBBS entrance examination. All the candidates who had applied and appeared for the AIIMS MBBS examination 2018 have been enthusiastically waiting for the result. 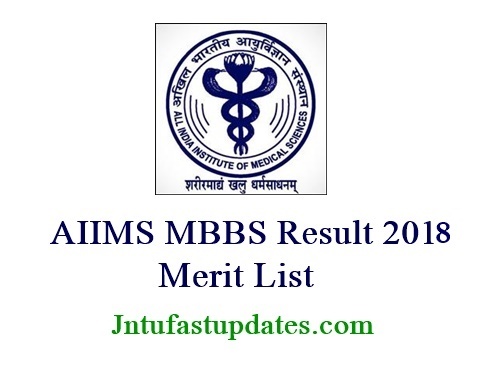 AIIMS MBBS Result 2018 declared on 18th June at www.aiimsexams.org. After much-anticipation for the AIIMS MBBS 2018 Result, the candidates can check out their result from Below. All India Institute of Medical Sciences has made an official announcement that the AIIMS MBBS Results 2018 will be declared by the Institution on 18th June, 2018 i.e., today on its official website. All the candidates who are eagerly waiting for the AIIMS MBBS Result 2018 can check out their result from the official website or from the direct link provided below soon after the official declaration. The All India Institutes of Medical Sciences (AIIMS) are a group of autonomous public Medical colleges of higher education. These institutes have been acknowledged as institutions of nation-wide significance by the Act of Parliament. AIIMS New Delhi is the fore-runner major excellence institution, which was initially set up in the year 1956. The All India Institutes of Medical Sciences (AIIMS) institution is responsible to conduct the MBBS entrance examination for all the ambitious candidates who are seeking to get admissions into various institutions of AIIMS every year. Likewise every year, this year All India Institutes of Medical Sciences has released an official notification and invited all the eligible, interested and aspiring candidates for online applications. The candidates who had applied and appeared for the AIIMS MBBS Results 2016 can check out their result from the direct link given below or from the official website. All India Institute of Medical Sciences (AIIMS) has announced that it will declare the AIIMS MBBS Results 2018 will be declared i.e., on 12th June, 2018 at the official website. Candidates who had applied and appeared for the exam can check their result from the direct link provided below. The AIIMS Medical Entrance Examination was conducted on 27th May, 2018 (Sunday) for which about 2 lakh aspiring candidates have appeared for the entrance test. The AIIMS MBBS Medical Entrance examination is held by the central authority in order to pick out the ambitious medical students for providing admission into MBBS Medical programme at any of its 7 AIIMS institutes located across India. AIIMS has conducted the MBBS medicine entrance examination for admission to 672 seats in 7 AIIMS institutions in India. Candidates can check and take a print out of the AIIMS MBBS Result 2018 from the direct link provided below. How to Download AIIMS MBBS Entrance Results 2018? Step 1: Initially, log on to the official website of AIIMS. Step 2: The homepage of the official website will be displayed. Step 3: Simply click on the link saying AIIMS MBBS 2018 Results. Step 4: You will be directed to a new web page where you need to enter all the essential details like your Registration number and other required details in the provided fields. Step 5: Once you enter all the required details, just hit the submit button. Step 6: The AIIMS MBBS result 2018 will be displayed on the screen. Step 7: You can now take a printout of the result for future reference. The Below counselling dates are given as per key dates kept in official website. Final official dates will be update soon. Stay tuned for latest updates and information regarding the AIIMS MBBS 2018 Results, Merit List, Counselling schedule and much more. I have got 89.7 percentile (Candidate ID: 5181101689 and Password: Ue8M4A) in AIIMS entrance exam and want to get admitted in AIIMS, so that i get d best education n can further clear all dirtiness in medical field. Are you that AIIMS results will be out today? Pl refer MBBS entrance 2017 AIIMS results. Congratulations to AIIMS administration for declaring rank wise and roll number wise list for 1st counselling. Those candidates who who could not make the 1st counselling list remain totally unaware of their performance in the said entrance exam. I request the concerned authorities to publish roll number wise result of all such candidates, along with subject wise marks obtained by them so that they know, in which subject they fared good or bad , for their future guidance. This is the wish of each and every candidate who appeared in the AIIMS admission test for MBBS. Pl do the needful without delay. I don’t check my result because I don’t know my roll number. How will I proceed? ?